Passengers are welcome to board our ship at 4:00 p.m. We'll start sailing towards the South of France. After comfortably settling into your cabin, we'll introduce our crew at a welcome cocktail. Dinner tonight will be followed by an evening of entertainment. Our ship will cruise through the night. After dinner, join us for an excursion for both packages: Guided tour of Arles. This afternoon, join us on an excursion for both packages: Tour of the Ardèche Gorges. Afterwards, we'll return on board and cruise towards Viviers. This morning will be spent cruising. In the afternoon, join us on an excursion for both packages: Discover the Vercors and taste the famous Clairette de Die*. We'll return on board in Tain-l'Hermitage. Tonight is our gala evening and dinner. We'll cruise towards Lyon. 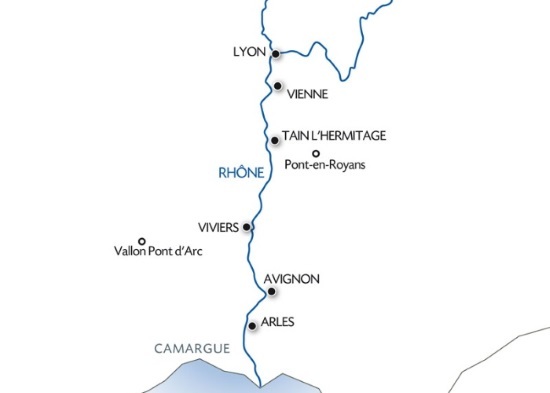 Depending on mooring availability, the stopover in Arles could be replaced by a stopover in Avignon.